Each spring, the U.S. Capitol Historical Society hosts a symposium dedicated to exploring the history of Congress. This year marks the ninth year of a series, “The National Capital in a Nation Divided: Congress and the District of Columbia Confront Sectionalism and Slavery,” which has already produced several books of scholarly articles. This spring’s theme? Creating an Army to Preserve the Nation. That topic may seem limited, but scholars from around the globe have found myriad avenues to wander, with just a bit of traditional military history to pave the way. 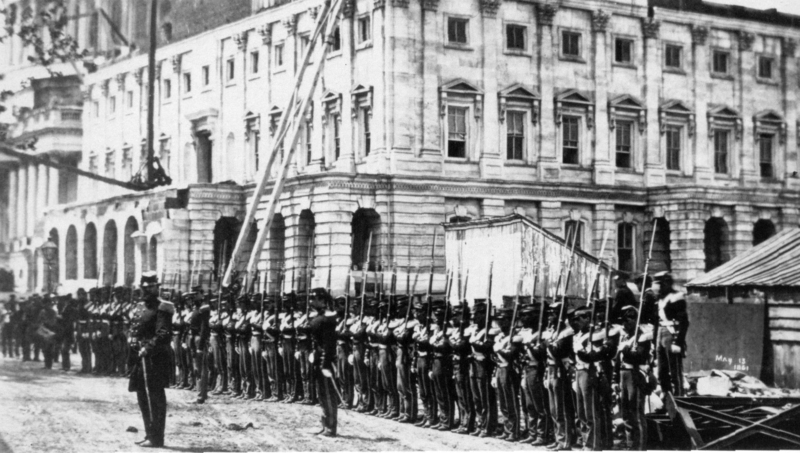 After all, Congress was doing its job in the Capitol, not on the battlefield. Thursday, May 3: Keynote address and opening reception with Catherine Clinton (all the way over from Queen’s University in Ireland), whose talk, “Mary Lincoln vs. Congress: A Thirty Years War,” is about Mary Lincoln’s contentious relationship with Congress and her attempts to manipulate budgets in her favor. 6:30-8:30 pm in Room G50 of the Dirksen Senate Office Building. Friday, May 4: Eight speakers regale you all day on topics ranging from African American and German American soldiers to riots to political maneuvering over generalships and the economics of paying for the war, including the creation of the IRS. The full list of speakers and their titles or topics is on our website. 9 am to 5 pm in Room G50 of the Dirksen Senate Office Building. Again, check our website for more details and plan to join us if you can! You can also leave questions in the comments.